Fort Duncan Regional Medical Center offers comprehensive radiology services to residents in the area. Several types of radiological procedures are available to help detect, diagnose and guide the treatment of many diseases and injuries. An X-ray image is produced when a small amount of radiation passes through the body to expose sensitive film on the other side. The ability of X-rays to penetrate tissues and bones depends on the tissue's composition and mass. The difference between these two elements creates the images. The chest X-ray is the most common radiologic examination. Contrast agents, such as barium, can be utilized to highlight the esophagus, stomach and other parts of the body. Computed tomography (CT) shows organs of interest at selected levels of the body. CT scans produce detailed organ images by stacking individual image slices. CT scans can image the internal portion of organs and separate overlapping structures precisely. The scans are produced by having the source of the X-ray beam rotate around the patient. An array of sensors detect the X-rays passing through the body and provide information that is processed and displayed as an image. Mammography is the most common imaging technique used to detect breast cancer. Mammograms use a low-powered X-ray to provide pictures of breast tissue. These images can detect abnormalities in the breast before anything can be felt. It is recommended that women over 40 or younger women with a family history of breast cancer have annual mammograms. 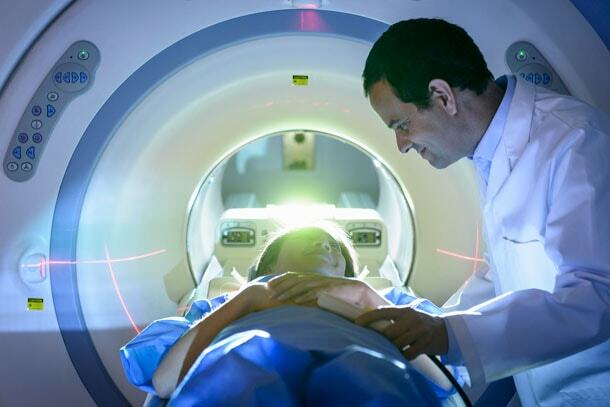 Magnetic resonance imaging (MRI) produces detailed images of internal organs and tissues. Since no X-ray is used during an MRI, there is no radiation exposure. MRI uses a large magnet that surrounds the patient, radio frequencies and a computer to produce its images. MRI can be effective in diagnosing a wide range of diseases throughout the body including cancer, heart disease, liver disease, stroke and more. Nuclear medicine is a medical specialty that uses safe and painless techniques to both image the body and treat disease. Nuclear medicine uses very small amounts of radioactive materials, or radiopharmaceuticals, that emit gamma rays that can be detected by special types of cameras. These cameras work with computers to form images that provide information about the area of body being imaged. Ultrasound is a technique that uses sound waves to show a picture of arteries, veins, organs or a fetus. Because it uses sound waves instead of radiation, ultrasound is safer than X-rays. Ultrasound has become an increasingly important part of prenatal and general healthcare by providing information that can guide a provider's care plan. Today, up to 70 percent of pregnant women in the U.S. have an ultrasound examination performed. Vascular ultrasound bounces sound waves off the body’s cardiovascular system to create motion images. Without radiation, vascular ultrasound produces a picture of how the blood vessels are constructed and functioning. This helps monitor the blood flow throughout the body and can be used to identify blockages, clots and more.